Cover Art by CHENG RAN. MAGAZINE ISSUE 177, March 2016. 178 pages. On The Cover:'Connie'by Lucas Blalock (2014). MAGAZINE ISSUE 170, April 2015. 164 pages. On The Cover:'UNTITLED'by DANH VO (2015). MAGAZINE ISSUE 171, May 2015. 240 pages. MOSHEKWA LANGA. ALEANA EGAN. ALEJANDRO JODOROWSKY. Magazine #159, NOVEMBER - DECEMBER. AND MANY MORE. SHAMBHAVI KAUL. BRITISH ART AND THE 1990S. LAUREN CORNELL. On The Cover:'LA FIERA'by MARIA LOBODA. MAGAZINE ISSUE 172, June / July / August 2015. 196 pages. SPECIALLY COMMISSIONED COVER DESIGN BY HELEN MARTEN. MAGAZINE ISSUE 155, MAY 2013. 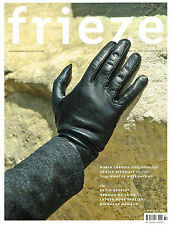 Frieze masters Women in art history magazine issue 7 edition . Condition is New. Dispatched with Royal Mail 1st Class. PIERRE HUYGHE "HUMAN MASK"ON THE COVER. MAGAZINE ISSUE 168, January/February 2015. 166 pages. JOHN M ARMLEDER. MAI-THU PERRET. GERMAN FRIEZE. 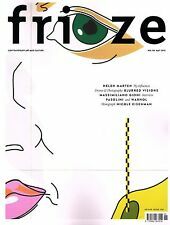 rieze d/e is a fully bilingual German/English magazine with its own editorial team and independent content. d/e stands for Deutsch and English. Magazine #10, JUNE - AUGUST. 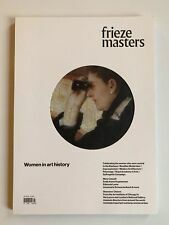 BN Frieze Masters Magazine Issue Nº7 Women In Art History Edition Condition is New. Dispatched with Royal Mail 1st Class. Frieze Masters Women in Art History Magazine Issue 7 Edition. Condition is New. Dispatched with Royal Mail 2nd Class. Free postage! 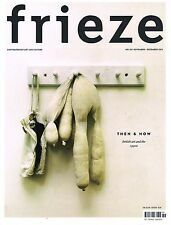 FRIEZE MAGAZINE. VERY GOOD CONDITION. Also in this issue: Claire-Louise Bennett delves into the fantasy worlds of Dorothea Tanning on the occasion of her major retrospective, ‘Behind the Door, Another Invisible Door’, which travels from Madrid’s Museo Reina Sofia to London’s Tate Modern. 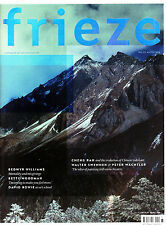 FRIEZE ART MAGAZINE ISSUE 118 OCTOBER 2008. 320 pages of Contemporary Art and Culture. Handled with Care: Rhonda Lieberman on Jim Isermann. Snakes and Daggers: Greg Hilty on Philip Taaffe. Planetary Folklore: Jorg Heiser on the legacy of Victor Vasarely. 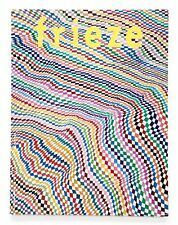 FRIEZE #41. Picture: Disturbed Black Hole by Peter Seville. 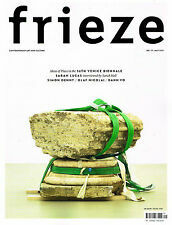 Frieze is the leading magazine for contemporary art and culture. 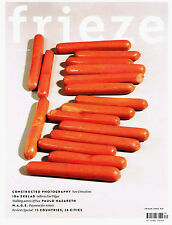 Frieze Magazine - Art, Culture & Appropriation. On The Cover:'FOREBODING'by ENRICO DAVID. MAGAZINE ISSUE 174, OCTOBER 2015. 268 pages. Cover Art by AYE ATON. MAGAZINE ISSUE 176, January - February 2016. 162 pages. Cover Art by Allison Katz. MAGAZINE ISSUE 178, April 2016. 160 pages.